Mezuzah Mysteries — or Is this really a doorway? Within the last few months, I was sent the following e-mail shaylos complete with accompanying diagrams and photos. Raphael* sent me an e-mail which included an attachment with the layout of his new apartment (see attachment entitled "map"). He wants to know whether he needs to place a mezuzah at the doorway out of the lounge marked "Sofek 1", and also whether the entrance to the kitchen requires a mezuzah. Both instances are not architecturally proper doorways, but entrances formed by walls. *Although all questions mentioned here are authentic, names have been changed to protect each individual’s privacy. Yisroel sent me photographs of his hallway to determine whether he needs to place a mezuzah at its entrance (see attachment entitled "is this a mashkof"). In modern residences, many rooms are not entered via doors, but through entranceways. Do these entrances require a mezuzah? In order to answer, we need to explain when a doorway requires a mezuzah. The laws governing when one must place a mezuzah are indeed complicated. The Rambam establishes ten rules that must be met to require a mezuzah, of which the following three issues are germane to answer the above questions. According to all halachic authorities, a doorway does not require a mezuzah unless there is a mashkof, a lintel that comes down from the ceiling to form the appearance of a doorway. Let me explain. When building a house, one must be certain that the part of the building above a door or a window is properly supported so that the building does not tumble down on its inhabitants, something that will ruin the contractor’s reputation and potentially could hurt someone. A lintel is the architectural piece that provides this support. The lintel rests its own weight and that which it supports on sideposts. The laws of mezuzah do not require that the sideposts or the lintel actually carry the weight of the area above the door. It is adequate if the mashkof, or lintel, merely provides an aesthetic function of giving the entrance the appearance of a doorway. However, when there is no mashkof at all, that is, nothing comes down vertically to give the appearance of a lintel, there is no requirement to install a mezuzah, even when there are two proper sideposts and even when there is a door. In modern construction, most doorways to kitchens, living rooms, dining rooms, and dens do have a piece of wall that protrudes down from the ceiling to give the appearance of a mashkof. This is for aesthetic reasons – to provide more of a sense that this is a separate room. 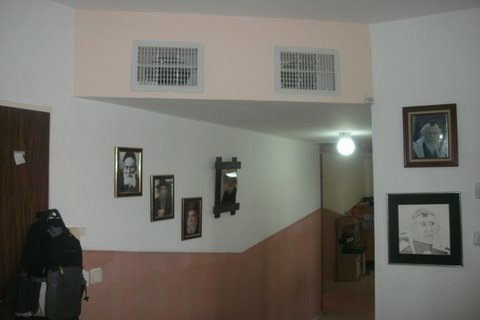 However, when the ceiling above the room’s entrance is a horizontal plane without anything protruding downward to form a mashkof, there is no requirement to install a mezuzah even when the entrance has all the other appurtenances of a door. At this point, I suggest you look carefully at the other attachment, the one that Yisroel sent. Is this considered a mashkof? What happened here is that air conditioning ducts were installed in the hallway thus giving the entrance to the hallway somewhat of an appearance of being a doorway. However, in my opinion, there is no real mashkof here since it does not come down vertically to create an entranceway. The ducts have become the ceiling of the hallway, which therefore has a lower ceiling than the larger room in front. I do not consider this a proper mashkof and therefore ruled that they do not need to place a mezuzah here. The map that Raphael sent bears no indication whether either questionable doorway contains a mashkof. Thus, on the basis of the map alone I could not provide an answer. Is this considered a sidepost? Assuming the there is some form of mashkof on each questionable entranceway, our next question is whether the walls that form each of Raphael’s "sofek" qualify as sideposts. "Ameimar said: an entranceway formed by a corner (in Aramaic de’ikarna) requires a mezuzah. Rav Ashi said to Ameimar: ‘But it has no sidepost!’ To which Ameimar retorted, ‘these [that is, the corners of the wall] are its sideposts’" (Menachos 34a). What is meant by "an entranceway formed by a corner"? The Rosh (Hilchos Mezuzah #14) explains that the case is where one entire wall of the room or house is missing, and thus the entranceway is created by the wall ending, rather than the existence of an actual door. This is exactly what we find in modern construction, where the entrances to kitchens, dining rooms, living rooms, dens, and hallways are often created without a proper entranceway, but simply by a wall. In our apartment map diagram, both entrances that Raphael labeled as "sofek" are graced with this phenomenon. Rav Ashi rules that these rooms have no sideposts, and therefore no requirement to place a mezuzah. Ameimar disagreed, contending that the "ends" of the walls qualify as sideposts. Both scholars agree that if one side of the entrance does not have the end of a wall, but is a continuing wall, that there is no sidepost on that side. We have exactly such a phenomenon in Raphael’s sofek 1 where there is no sidepost on the left side. Does this automatically remove the requirement of mezuzah? For this we need to examine a different passage of Gemara. "Rav Papa went to Shmuel’s house and saw a doorway that had a sidepost only on its left side on which there was a mezuzah. Rav Papa said to him: ‘Were you intending to follow Rabbi Meir’s opinion (who required a mezuzah even if there is only one sidepost)? Rabbi Meir required a mezuzah on a doorway with one sidepost only when its sidepost is on the right side, but not when there is only a sidepost on the left side.’"
Thus, Rav Papa notes that when the only sidepost is on the left side, there is no requirement to place a mezuzah according to all opinions. When the solitary sidepost is on the right side (entering the room), then whether there is a requirement to install a mezuzah is dependent on a dispute between Rabbi Meir and the Sages. "To what comment of Rabbi Meir are we referring? To the following teaching: A house with only one sidepost, Rabbi Meir requires it to have a mezuzah and the Sages exempt it. What is the reason of the Sages? The Torah says mezuzos, which is plural," or a minimum of two (Menachos 34a). Do we rule like the Sages or like Rabbi Meir? The Rambam concludes like the Sages and therefore in his opinion one needs a mezuzah only when there are two sideposts. This is how the Shulchan Aruch concludes. According to this approach, there is no requirement to place a mezuzah unless the entrance has two sideposts. This approach would exempt the doorway labeled "sofek 1" from the mitzvah of mezuzah. However, most authorities rule that if there is a right sidepost one should place a mezuzah there, albeit without a beracha. Thus, according to most opinions, the entrance leading towards the bedroom of Raphael’s apartment would require a mezuzah (assuming that is has a mashkof) but without a beracha. In the Rambam’s opinion, a mezuzah is required only when the house or room’s entrance has a door. In this instance, the Rambam’s position is a minority opinion, since most other Rishonim contend that the lack of a door does not absolve the requirement of a mezuzah. The accepted conclusion is to install a mezuzah in a doorway that has no door, but not to recite a beracha when doing so out of deference to the Rambam (see Shulchan Aruch, Yoreh Deah 286:15). So now Raphael has his answer: The rooms where there is a right sidepost upon entering require a mezuzah without a beracha, provided that they have some type of mashkof. One would not recite a beracha on placing the mezuzah unless there is an actual door and also sideposts on both sides of the door. Aside from fulfilling a mitzvah commanded by Hashem, the mitzvah of mezuzah serves to remind us constantly of His presence, every time we enter and exit our houses. We touch the mezuzah whenever we enter or exit a building to remind ourselves of Hashem’s constant presence, and it is a physical and spiritual protective shield. Whenever passing it, we should remind ourselves of Hashem’s constant protection. Previous Previous post: The Milky Whey — Does Chalav Yisrael Apply Today?